Gosh, I have too many mentalism wallets, so I'm so pleased to now own the Complete Peek Wallet. Finally, there is a wallet that has a full peek (not part of a window), with easy, logical moves and a motivated peek (closing the wallet and closing the snap tab. I won't use this as my everyday wallet (but you could) since there aren't that many discreet spaces for credit cards, et al, but hey, that's just me. A wonderful product that allows me to sell off all those wallets collecting dust in my "box-o-magic crap". At $50, this is a bargain and a tool you'll use often for peeks and card/billet to wallet effects. Thank you for giving me the heads up via email. 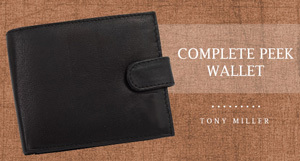 I don't buy things often, but I needed a new wallet and Vanishing's email ad came in just at the right time. It's a very nice wallet and I've already startled some friends with the peek. I was worried about angles at first but it looks like the wallet covers that up nicely. Such a bold peek under such natural handling. Hands down the best thing I got for Christmas this year. You can do MIRACLES with this of true mindreading. Thanks Vanishing Inc and Tony Miller for making a product that is truly BEST IN CLASS. Got mine this morning,and Its even better than I had expected,and top quality for the price. The methods are so simple,I tried it out on the girlfriend before I had even seen the video..she didn't have a clue. I only need space for money a bank card and my driving license,so this is ideal as my every day wallet too.